A step ahead of the competition; our racing simulators offer a thrilling racing experience. where players compete to notch up the fastest lap time and be top of the 'Top Gear' leaderboard. At the end of the event, the fastest guest will be awarded a prize - such as a bottle of chilled bubbly! Racing simulators are a very popular and memorable way of entertaining guests and friends alike. They're perfect for corporate events and birthday parties by adding a touch of friendly competition. Choose from famous racetracks and drive around in the racing car of your dreams - without having to worry about the rush hour traffic! We'll customise your experience to your event by offering help, theming, and a member of staff. A member of staff to run your event, keep track of scores and announce the winner at the end of the night with a bottle of bubbly! Fancy going all out on your racing entertainment? Why not consider a chequered flag theme, with a stunning red carpet entrance, flame effect lights and winners podium! 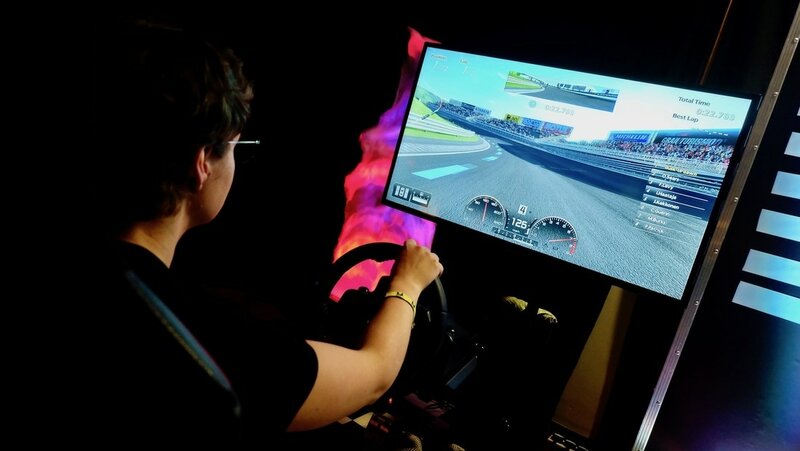 We offer complementary package deals - book our Racing Arcades with other entertainment options such as racetrack lighting to get our best pricing. Have you considered our fun casinos tables?